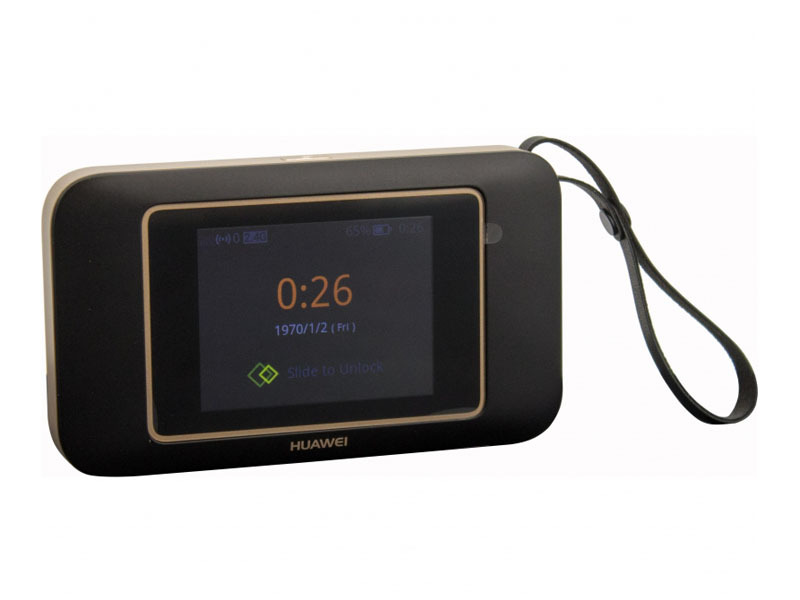 The Huawei E5787 is a new modern LTE-Advanced hotspot with a large touchscreen display. The download speeds of up to 300 Mbit/s can be achieved, in the upload up to 50 Mbit/s are possible. The battery is easily replaceable by the user and has a term of up to 12 hours working time. 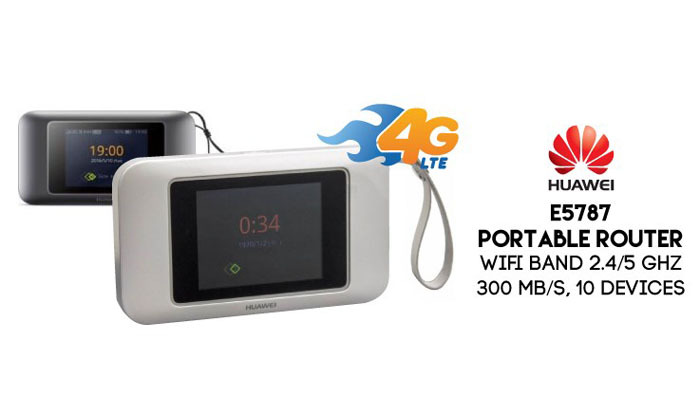 With fast WLAN AC, Huawei E5787 hotspot can supply up to 10 devices simultaneously with an internet connection via USB cable. 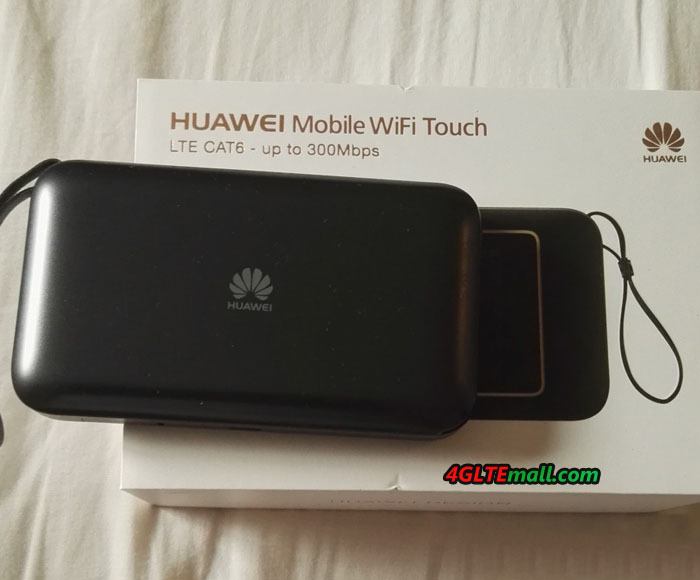 The Huawei E5787 Hotspot is manufactured by the Chinese manufacturer Huawei and it provides a current LTE-Advanced CAT6 modem for up to 300 Mbit/s downstream and up to 50 Mbit/s upstream. It’s the second LTE cat6 mobile router from Huawei. The modem is manufactured by HiSilicon and also comes with the predecessor model Huawei E5786. Although the Netgear AirCard 810 is already a faster LTE hotspot, the Huawei E5787 is one of the fastest mobile LTE routers on the market. Most other devices provide only up to 150 Mbit/s in download (LTE CAT4). Of course the E5787 4G hotspot is also backward compatible with older wireless technologies GSM and UMTS (3G and 2G). In the UMTS network, up to 42.2 Mbit/s download via DC-HSPA+ is possible with GSM Data Accelerator EDGE is supported. Regarding the supporting frequency bands, we suppose the version for Europe FDD-LTE networks would be first available, ie. Supporting LTE band 1/3/7/8/20(800/900/1800/2100/2600MHz). Unlike its Huawei E5 predecessors, Huawei upgraded the screen on the Huawei E5787 because it has a large touchscreen display. 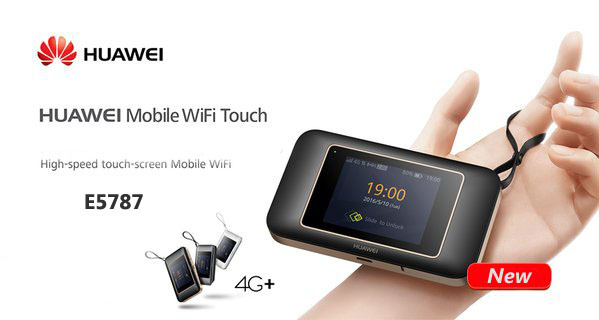 So it’s also called Huawei E5787 Mobile WiFi Touch. Thus, the hotspot can quickly and easily use, which you already know and experience it from your smartphones ago. The key features like data consumption, connection time and receive status are displayed directly on the home screen. More detailed information you get on the menu that is graphically appealing. This feature was already available on Netgear Aircard 790s and 810s for long time. On this point, Huawei follows Netgear’s steps, but it should be the mainstream for high-level gadgets now. Compared to its predecessor Huawei E5786, Huawei E5787 has a removable battery. This has a capacity of 3000 mAh and will provide an operation time of approximately 12 hours. If there are many devices simultaneously connected, the capacity will probably be more likely to be slightly lower. The integrated WLAN radio module distributes the Internet connection of various devices such as laptops, smartphones and Tablets. On request, internet access via USB is possible and due MicroUSB cable is included and is also used to charge the battery. The wireless radios on both 2.4 GHz and 5 GHz, and supports the latest standard 802.11ac, so that the high-speed LTE also arrives at the terminals. The Huawei E5787 is currently only available abroad, for example in Saudi Arabia. The online store www.4gltemall.com also provides the unlocked Huawei E5787 mobile WiFi touch for global shipping. 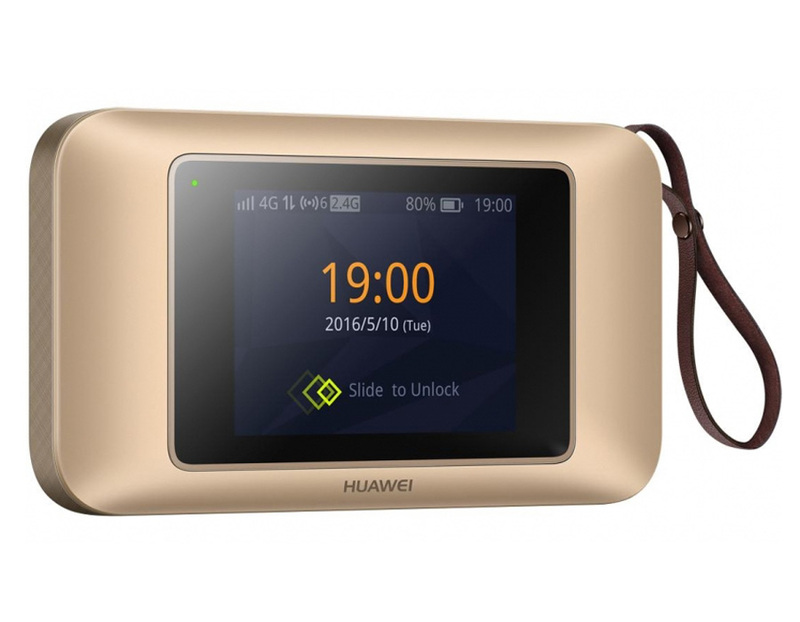 If you can confirm the Huawei E5787 is compatible with your local LTE networks, you may get the new fashion mobile WiFi hotspot from www.4gltemall.com. 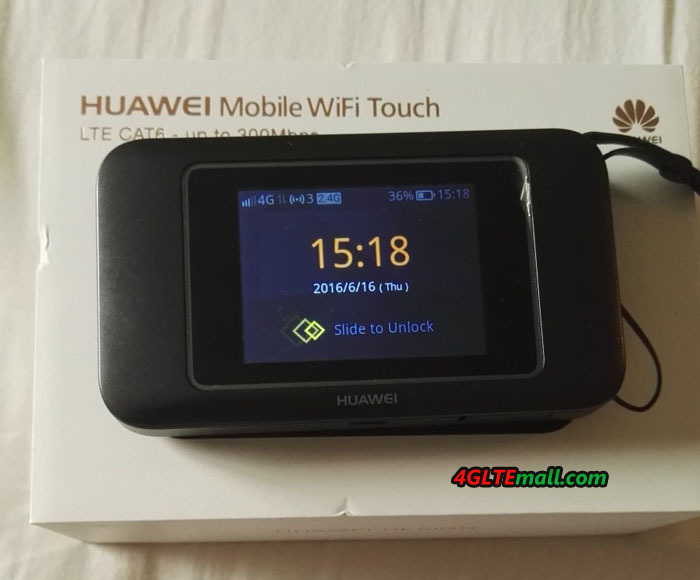 The company “Huawei” in Saudi Arabia has launched through its agent a new mobile device – E5787 Mobile WiFi Touch (LTE Cat6 Hotspot), which offers advanced features for the connections to the Internet on the go from anywhere and at any time, and it provides the highest speed downloading and reliability possible connection. The connection speed is faster, almost double than the third generation communications technology. Huawei E5787 allows downloading high-definition movies in half a minute and speeds of up to 300 megabits per second based on the LTE-advanced CAT6 technology. Huawei Mobile WiFi Touch E5787 features a unique design; the experts relied on curved surfaces and low thickness, as well as the use of distinctive inscriptions and variations in the materials used, while maintaining the granulated users play button. The device uses a metal frame in the middle rear area, with the use of reinforced aluminum in the Play button. There is a 2.4 inches touch screen which will help user to operate the setting and see important connection information. Actually, other vendors already use this feature in their devices, such Netgear Aircard 790s and Aircard 782s. Huawei E5787 is the world’s first device with HiSilicon LTE processor used Cat6 HPM Cortex A9 manufacturing 28-nanometer technology, which offers high performance levels and higher speeds communication, in addition to the low heat emitted and smoother interaction with the E5787, which is convenient for those who wish to surf Internet and play electronic games with others online, as well as watch the video. 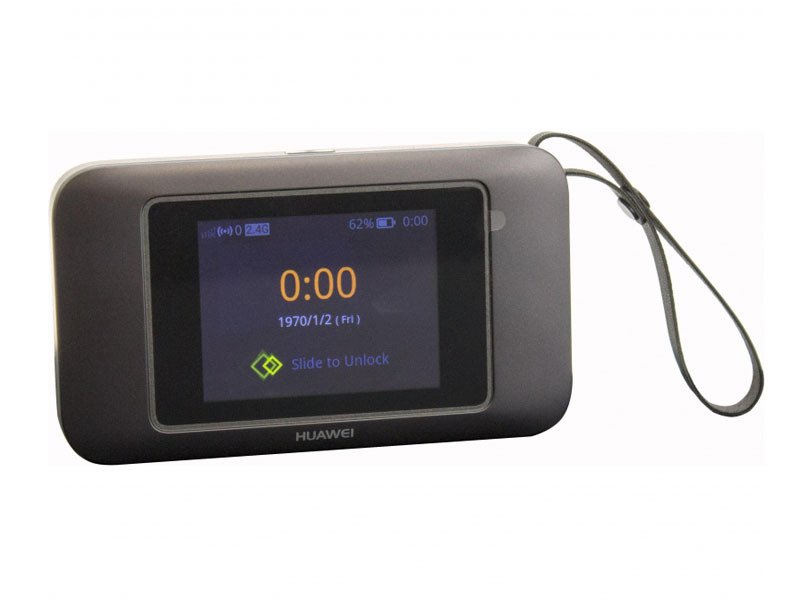 Huawei E5787 MiFi offers high accuracy without interruption, which also proves the high quality of the new chipset. 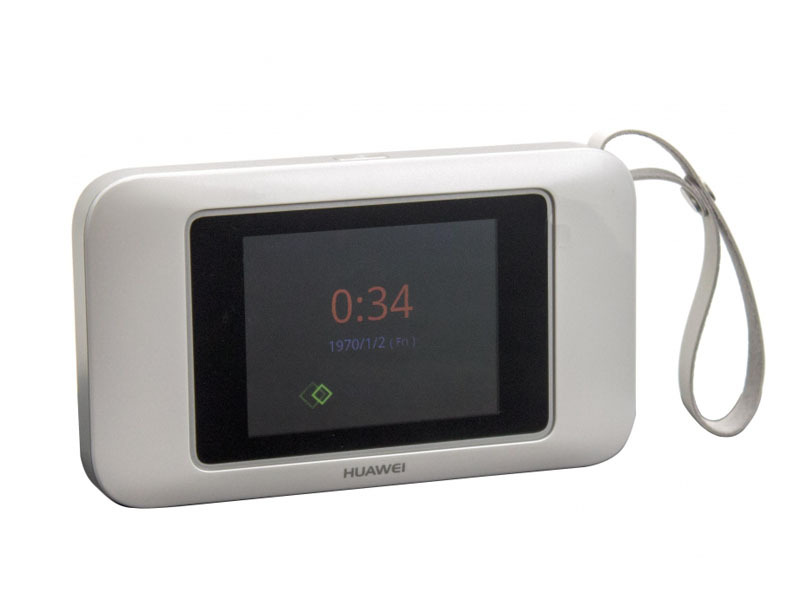 The operation of Huawei E5787 hotspot could be done through the colored glass touch screen, which contains the area light up periodically to indicate the status of the connection to the Internet at a glance, and without having to run the screen. Some features can be adjusted for displaying messages received from the telecommunications company, and modify WiFi network to be “local private” or “public for all” with the presentation of the names of all those connected devices to the network. Users can also modify the display language, and setup the amount of data consumption considering to the maximum data plan of the user, and edit password for using the device, and other options. What’s more, up to 10 people can connect to the Internet through the E5787 using the wireless network, as well as an additional user can connect via the “USB” port. Huawei E5787 mobile hotspot also provides a slot for flash memory cards. Other devices could share the data via the E5787 in the “Micro SD”card. By the way, the Huawei E5787 router works with Mini SIM card. With the strong battery, Huawei E5787 can keep working for almost 12 hours, and the standby time could be 600 hours. 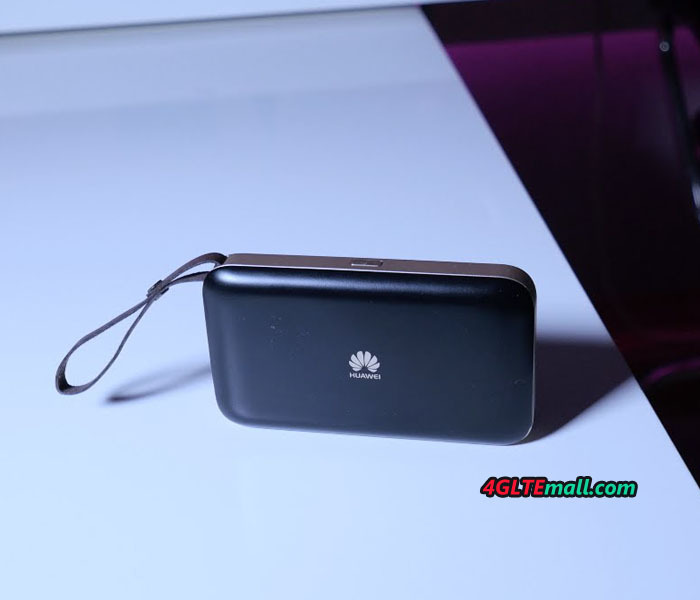 The Huawei E5787 Mobile WiFi Touch uses a mobile screen with a diameter of 2.4 inches to modify options and display the data, with the ability to download data at speeds of up to 300 megabits per second. The device can work for 12 hours of continuous use or 600 hoursthanks to the built-in battery with a capacity of 3000 mAh per hour. The Huawei E5787 supports networks “Wi-Fi” technologies a, c, b, g and n and dual-band 2.4 & 5 GHz, with the support of the fourth-generation communications networks. The E5787 supports WEP encryption and WPA and WPA2 data protection technologies, with a thickness of only 7.5 mm, and a weight of 155 grams, and is available in white, golden and black colors. 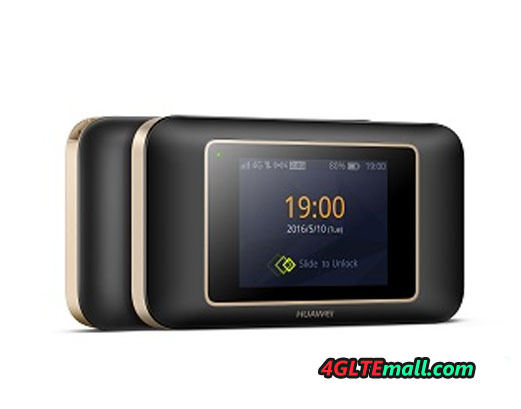 We can conclude the Huawei E5787 is more user friendly than its predecessor Huawei E5786, which is already the best seller of 4G portable router in 2016.